Summer might be gone, but Summer sausage can still be enjoyed. Most everyone knows that Summer sausage is any sausage that can be kept without refrigeration. Summer sausage is usually a mixture of pork and other meat such as beef or venison. Summer sausage can be dried or smoked, and while curing ingredients vary significantly, curing salt is almost always used. Seasonings may include mustard seeds, black pepper, garlic salt, or sugar (Wikapedia ). Sausage in Latin is salsicius, which means “prepared by salting.” Sausage has its origins since ancient times as a method of preserving meat but many experts believe the sausage was first invented by the Sumerians, in what is now Iraq, about 5,000 years ago. As for the benefits of basil in the vinaigrette link here to the Health News Library and read how basil is an alternative to treating depression: Holy Basil a Natural Anti-Depressant. 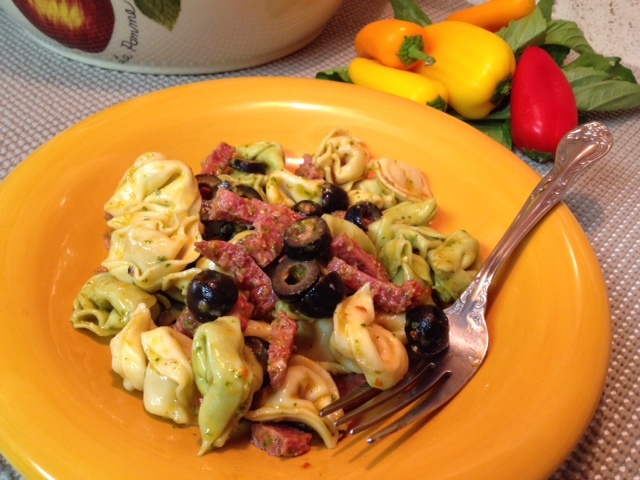 Now for our featured recipe: Tortellini and Summer Sausage with Tomato Basil Vinaigrette, and here is what you will need. 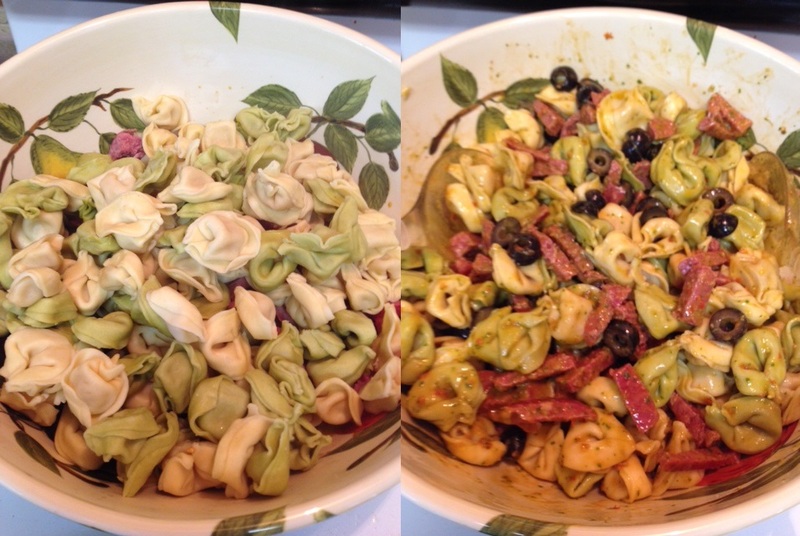 Before making the vinaigrette, boil and cook the tortellini according to package instructions. Basically is to bring to boil a pot with 5 quarts of water, add pasta and cook for 6 to 9 minutes. drain off water and set aside to cool. 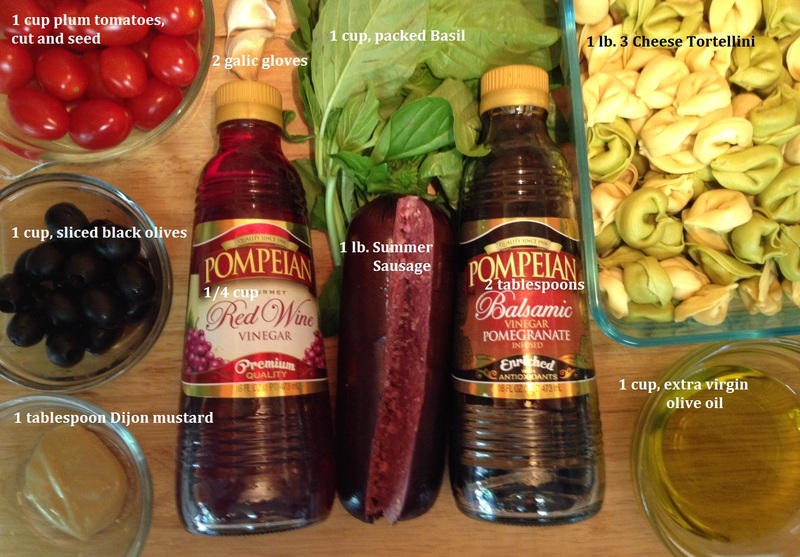 While the pasta is coking you can make the vinaigrette. From the ingredients on our cutting board you will need the following. Place the first 6 ingredients and 1/2 cup of the olive oil into a food processor. While processing, add the remaining 1/2 cup of olive oil, and process until well blended. You can season to taste with salt and pepper. But as the sausage is curd with salt, you may not want to add any salt to the mixture. Set aside. 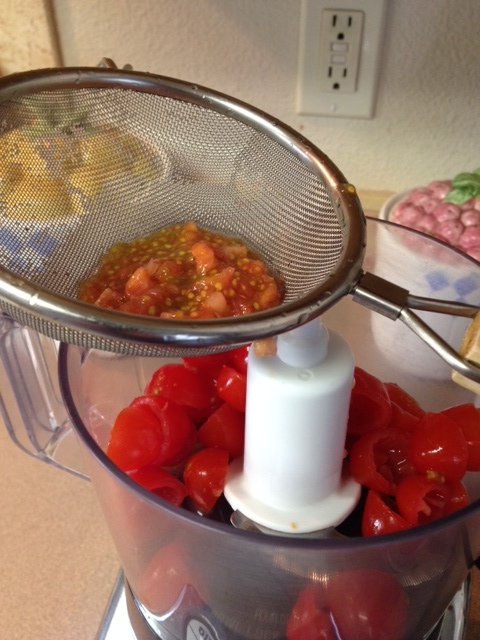 I prepared the tomatoes, seeding them, and then placed them first in the processor, and put the seeds and veins into a small strainer, and placed it over the opening of the processor to allow the tomato juice to drip off over the cut plum tomatoes. Next slice up the sausage into small strips, set aside. For the olives I used a can of whole medium olives, and sliced each 3 times, till I measured a cup. By this time pasta should be ready to mix with the prepared ingredients. Add 1 cup of Tomato Basil Vinaigrette to bottom of a large serving bowl. Next add prepared sausage, and olives. Add cooled, or a least semi-cooled tortellini to the bowl, and mix till ingredients are will coated with the basil liquid mix. 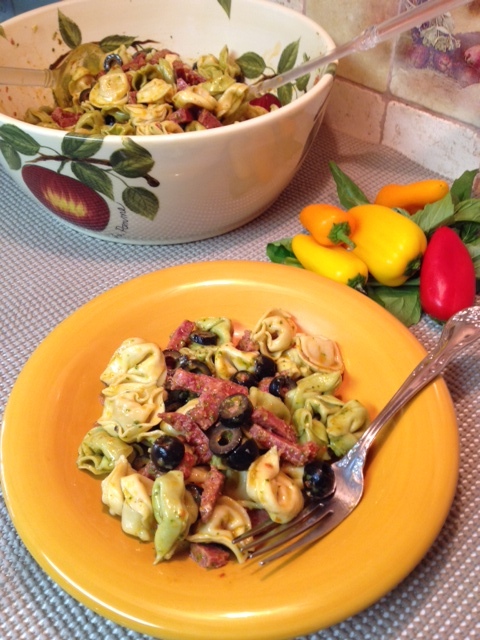 Plate and enjoy, Tortellini and Summer Sausage with Tomato Basil Vinaigrette. This entry was posted in Main Dish and tagged Basil Vinaigrette, Garlic, Ocimum tenuiflorum, Olive oil, Parmigiano-Reggiano, Pasta, Sea salt, Summer Sausage, Tortellini. Bookmark the permalink. Love tortellini. There is so much you can do with it. Yes it is a wonderful culinary invention!! Thanks Jovina for stopping by today. Weekend is just about here, and I wish you a good one! !